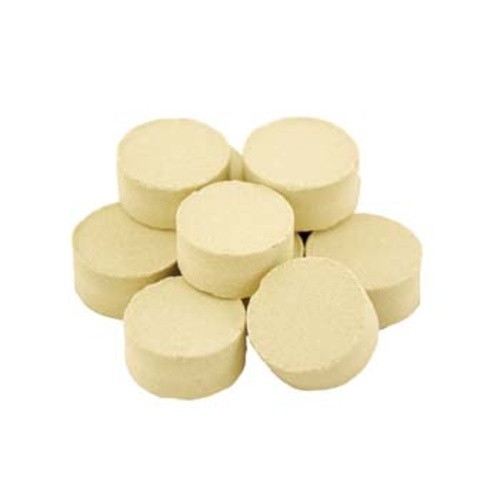 Whirlfloc tablets are a blend of Irish Moss and purified Kappa carrageenan that encourages the precipitation of haze causing materials such as proteins and Beta glucans. Prepared in a quick dissolving, highly soluble tablet form. Almost everyone who tries Whirlfloc tablets prefer them to regular Irish Moss. Add for the final 5 minutes of the boil. Note: One Whirlfloc tablet is good for 10-15 gallons of wort. We suggest using half a tablet for 5 gallon batches for most beers. Really clears up the beer! Never hurts to have extra. I prefer this to Irish Moss. Time clears all beers, but these certainly help speed the process along. makes reading the hydrometer easier. Does this just make the beer lighter? It precipitates out proteins in the malt during the boil so they clump together and settle. Helps clear the wort. No. It's a clearing agent. Added to the boil at about 15-20 minutes left in the boil. No, it makes the beer visibly clearer, less opaque. how many are in a package ? I use Whirlfloc in every batch. It's good at helping the proteins precipitate and much neater than regular Irish Moss. Good quality and fast shipping. More beer is your brewing convenient store. Best way to settle material in the boil pot! Having tried Irish Moss, Super Coagulants, and every other method out there, I can say that a Whirlfloc tablet does the trick. I have found that a half tab works for 5 gal. and one is plenty for 10 gal. I've only tried this product once, but was pleased. I went with half a tablet for a 5 gallon brew, and had good results without flavor change. Thinking I'll likely use these going forward instead of Irish Moss. A way more simple way to add some clarity to my beer as opposed to Irish Moss. Pre-measured tablets, how can you go wrong? Works as advertised, use a half tablet for a 5 gallon batch 10 from the end of the boil. Shipping was quick and easy! These are just part of my recipes. Does a great job of getting the cold break to fall out before transferring into the fermenter. I use whirlfloc in every beer that i want to be clear. I use 1 to 2 tablets per 10 gallons and they all come out very clear. Great product. I started out using Irish Moss, and just recently switched over to Whirlfoc. The simple ease of dropping one in with 15-20 minutes left on the boil is worth the few extra pennies. add last 15 min of boil...gets the wort nice and clear. I love easy solutions! I started using it because one came with all of my MoreBeer kits. Now that I'm building and brewing my own recipes I still rely on it. Helps the beer clear. What else do you need to know? I drop a tablet in every batch. An easy way to ensure clear beer. Works great. Whirlfloc tablets work the same for me as regular Irish moss does. The tablets are easier to use though. Half tab is enough for 5 gallons. Good stuff. Did 1 batch without these tablets and it had an unsettling haze. Friend recommended these to me and I will never brew a batch again without them! Work like a charm. Drop them in 5-15 minutes before end of boil. No need to measure. Toss them in the last 10 minutes of your boil and enjoy clearer beer. These little tablets, added with 15-20 minutes left in the boil, have really helped clear my beer. Highly recommended. This fining agent will turn your cold break into a gelatinous glob which can be left in the kettle rather than your fementer. Easy to use...just drop in one tab for 5 or 10 Gal batch within 15 min left in the boil and watch the magic as you cool the wort below about 80F. Great product to clear your beer! it whirls and it flocs! Nice clean beer was the result without even using a secondary. It's a no brainer addition. Couldn't be easier, plus this product delivers. Don't get caught without it. Much easier to toss one in rather than measure anything out. Especially with measuring out late hops additions. Never tried these until my last batch of beer. They work much better than Irish Moss. My last batch of Black IPA was clear as a bell after one racking. The only clarifer I've ever used. These work great. Well worth the cost. I've never had them fail to work. I get great results with just 1/2 a tablet to a 5 gallon batch. I use these in every batch of beer I make, easy to use and if you want clear beer give it a try. Used whirlfloc after a friend gave me a tablet to try and I was sold. Works great! Great. No messing around with measuring . This product is great. I tried it for the first time. I used Irish moss. The only problem I have is that I can't find it in Europe . I have to import a lot at a time. I brew quite often when I'm there . I like that it's a simple small tablet.. Break in half and drop it in. No mess. I just throw one in the boil for the last 5 minutes and I have ended up with some seriously clear beers! Very happy with this product. Clears things right up, forget using them on Hefe's or any beer that style allows for cloudy beer because will make them clean. I just ordered another 4 packages of these. This has made a very positive difference! These guys do exactly what is advertised: give you the best chance for clear homebrew! I brew 5 gallon batches, so this pack will last me the next 20 batches. Use it in conjunction with a wort chiller or something to get a good cold break and you'll have clear beer in no time! Don't use these.... unless you like Clear beer. You want to use these if you want your beer to be clear one tablet is Goodnuf for 10 gallons and works really well. I forgot to use Whirlfloc once on a pale ale and the cloudiness was immediately noticeable. Easy to use. I found myself a pill splitter in my local drug store since I brew 5 gallon batches - you only need a 1/2 tablet for 5 gallons. Much easier to use than Irish Moss. I even use in in darker brews to be safe. These tablets work great and really enhance the clarity of the beer. I find them to be a good value and will continue to use. Prior to this year I used supper Irish moss. This appears to works just as well and is cheaper and easier to use. Friends and family have not spoken about an off tastes and I have not noticed any either. Throw one in with 15 minutes left in the boil and you are set. What can you say, it's whirfloc?!?!?! Goes in all of my lighter beer batches, and some of my ambers. Not needed for darker beers, IMHO. You can get away with using half a tablet. Works well even if you only use half the tablet per 5 gallon batch. I used to use just Irish moss and still had some haziness to my beers and i contemplated starting to filter my beers. Then I tried these and have no need beers have been coming out awesomely clear. These work great. My beer comes out clear every time. I wont be messing around with any other clarifiers. I used to measure out and rehydrate Irish moss to add to my brew kettle. These save time and effort and make a noticeable difference in the clarity of my finished beer. Cheap, easy and effective. Easy to use and convenient. I used to use a half tab for 5 gallons and that is fine if you are sparging in a traditional style. I use a full tab per 5 gallons for BIAB due to the extra residual that I end up with from that style of brewing. You can see the difference when you use these. I usually add at the last 15 minutes and use one per 5 gallons. Have been using for years! Quick dissolving, prefered over regular Irish Moss. They do an excellent job for clarification.